Momma Told Me: Don't forget to eat! While everyone is busy discussing brining techniques versus deep frying, the average hostess forgets to consider the meals that will get you through the holiday preparation. Let's face it, when you're preparing to put a spread on the table for 20 or more, you're tight on fridge space, and fast food is typically the first solution to forgotten meals. After all, you still have to eat in between the feasts, right? My father hosts Thanksgiving at his house every other year, and he spends an entire week hand preparing the stuffing, side dishes, desserts and more. One of the first things I noticed, as his assistant, was that he often forgot to stop and eat between the grocery store trips and the potato mashing. Simple, but healthy, affordable meal options for holiday nights are now easier than ever to find. Stocked at your local Kroger location, Kroger Skillet meals and Salad kits offer delicious solutions the whole family will love. We have 3 Ralphs locations in our hometown and, during the holiday season, I sometimes find myself at the grocery store 3 or 4 times a week. I never know Ralphs offered their own in house range of skillet meals for two. These easy cook skillet dishes cook in less than 10 minutes, from freezer to table, and come in a variety of international cuisine options including Italian Sausage Rigatoni and Beef Stir Fry. 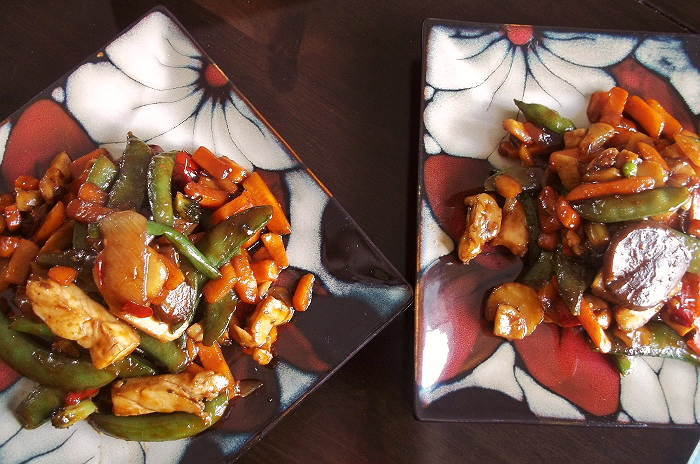 I recently picked up a Chicken Stir Fry Kroger Skillet to help us get through a busy November afternoon and was pleasantly surprised by the balance of protein (chicken) and vegetables. I was even more happy with the amount of sauce included in the easy pour satchet. 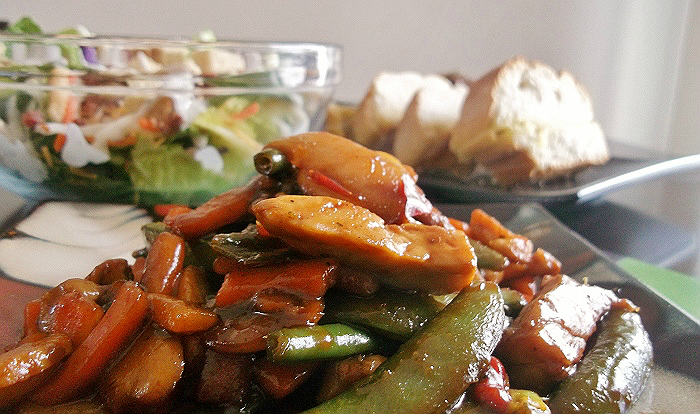 With other skillet meal brands I find myself reaching for secondary sauce bottles to help add extra flavor, but the Chicken stir Fry satisfied my picky taste-buds with hearty slices of mushroom, crisp sauteed pea snaps and tender slices of chicken. Of course these skillet meals don't quite make a 'meal' adding a few simple sides can really turn your lunch into a hearty dinner. 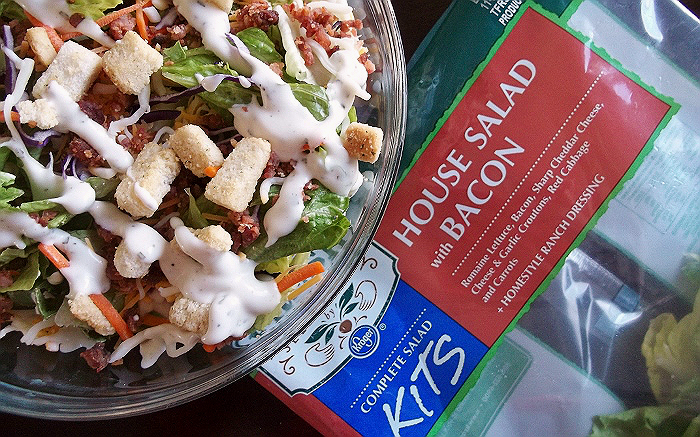 Kroger also carries a range of simple salad kits, including their House Salad with Bacon that includes crunchy croutons, tender bacon bits, and creamy ranch. 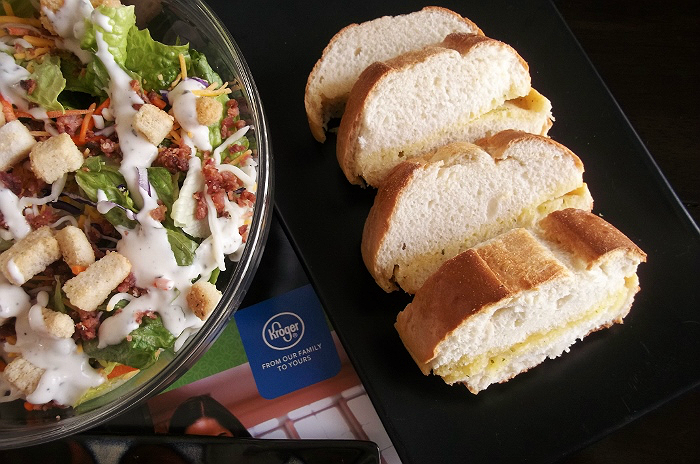 With a simple toss of the ingredients I had a fresh side salad that was so much more than another bagged lettuce blend, after all, who doesn't love ranch and bacon? We topped off the presentation with a loaf of Kroger's frozen garlic bread. I never knew Kroger offered a frozen bread range, and was a bit skeptical of the concept, but was quite surprised. 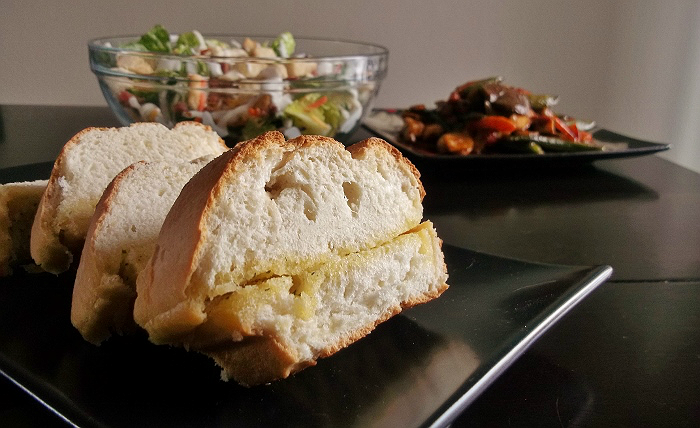 The lengthwise slit loaf had a thick and creamy garlic butter center that melted to perfection inside the oven, in just 7 minutes. Kroger offers several holiday staples sure to make your holiday season all the more enjoyable, and just a little less stressful. I love that I can pull a loaf of bread out of my freezer, rather than having to stop by the bakery on my way home. Having fresh oven warmed bread in minutes was a special treat during an afternoon we would have otherwise reached for yet another single serving cardboard meal. It's hard to believe the spread below was all made in less than 15 minutes; and, even better, the cleanup was as simple as washing our plates and a single skilled pan, then tossing some foil into the trash. 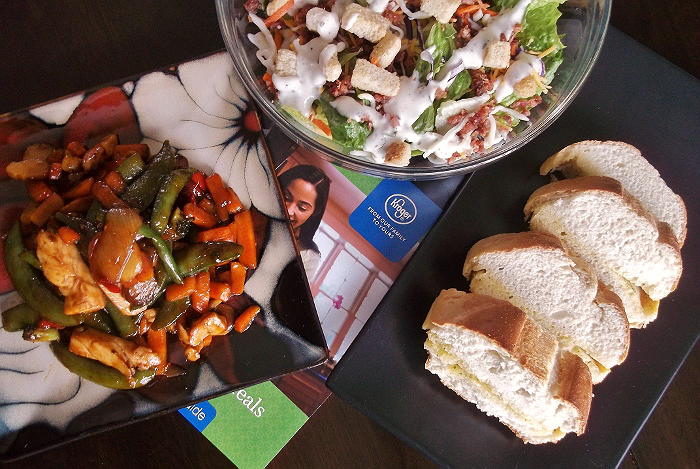 Who says you can't eat delicious, healthy meal on a busy schedule? 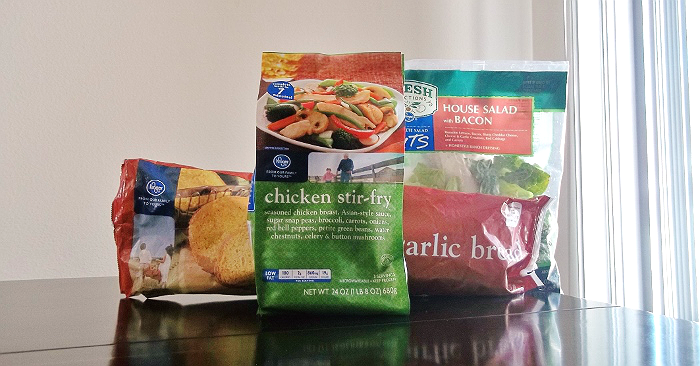 I had a chance to sample some of the convenient #KrogerSkilletMeals thanks to my BzzAgent (#GotItFree) Membership, but I had no idea I would be in for such a treat. I only wish our local Ralphs store stocked more of the delicious varieties- I'd try every flavor! 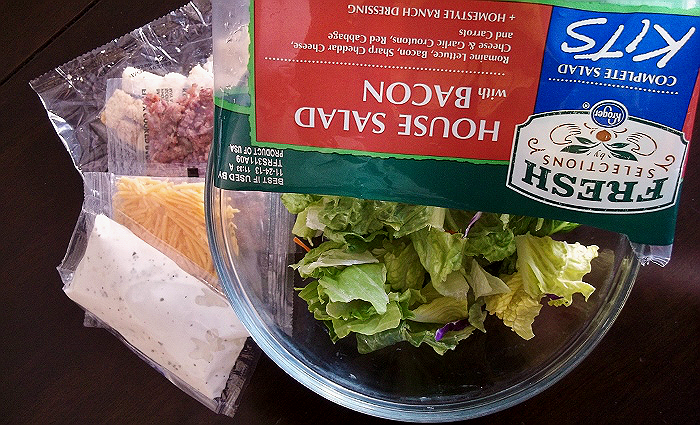 What are some of your mealtime tricks to help you get through busy holiday nights? What Daughter Says: Remember to plan for all the other 364 meals, this Thanksgiving! These look wonderful! I so wish I had a Kroger near where I lived. I am always hearing great things about them! It's always nice when you can prepare something quickly that tastes good and fills you up. We don't have Kroger stores here so I guess I'm missing out on some tasty food. These look so unbelievably good! Mouth Watering! I love kroger's meal kits! I use them all the time!